Finest selection of Taxco and Native American Jewelry – Clothing, home décor, wall art, furniture, working studio in Tubac – Designs by Darcy. Custom metal doors, window screens, gates, fences, and iron beds, metal wall art, and silver jewelry. Paula and Lincoln Wilson have traveled the world for their rugs. The Wilson’s appreciate the rugs as fine works of art. They hand select each and every piece using their expertise, choosing the most desirable weavings with the highest quality of each style and construction. The idea is to find rugs that will stay the test of time. In doing so they have created the most diverse collection in all of Arizona. You will easily find that work of art that appeals to you; from antique to new, classic traditional to contemporary, formal city rugs, handsome village rugs and increasingly rare nomadic rugs, coming from the far near and middle east as well as collectible Navajo and contemporary Zapotec Indian rugs. We would like you to experience the intoxicating effect that comes from discovering beauty in pure form. Tubac Old World Imports offers delivery service within the Tucson metropolitan area. Local art & pottery, mesquite furniture,lamps,mirrors,Talavera pottery, copper fountains,gifts and jewelry. 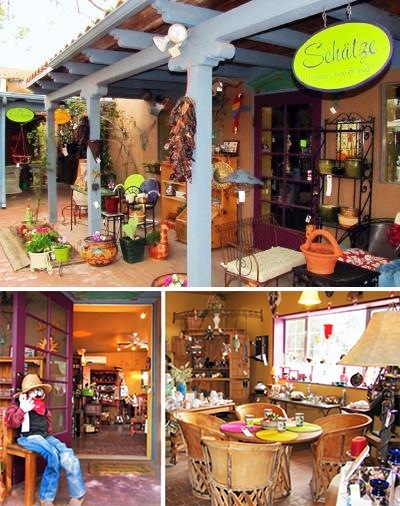 Schätze offers an eclectic selection of new and consigned home furnishings, accessories, art, jewelry and gifts. AtSchätze you can find a “treasure” for yourself, a gift for a friend, or even furnish a home. You never know what you’ll find atSchätze, and that’s half the fun of shopping here! New arrivals weekly. Quality “Pre-Owned” furniture, clothing and home decor. Mexican Pottery, dishes, glassware, iron benches, tables, clothing, linens, children’s items. “Don’t miss us, our prices will please you.” In Tubac since 1977. Dos Corazones (Two Hearts), is located in the historic village of Tubac, Arizona. The Mission of Dos Corazones is to “Release the Vision” by providing a full array of exquisite furnishings, from small finishing touches to entire rooms. We will put the “Heart” in your home! We are a “one of a kind” source for color, texture & design for your creative home ideas and styles. We offer endless lines of elegant furnishings featuring many different choices of Leathers, Upholstered Goods, Elegant Rustic furniture and Handpicked Accessories exclusive to our store. We also carry a beautiful line of outdoor furniture. We are a design center and offer complimentary design services, when working with you on your home, to assist you in bringing all elements together to create your perfect vision! Furniture and Accessories “from our Hearts to your home”. Discover the art of Mexico. Decorative items and silver jewelry displayed in our two locations – 14 Tubac Rd. and 16 Plaza Rd. 14 Tubac Rd. & 16 Plaza Rd.